Francesca Lia Block, September 2010. I remember, as a teen, loving the spiky, poppy prose confection that was Weetzie Bat. I reread it in library school for my YA lit class, and it stood the test of time. So I had high hopes for The Frenzy that were, sadly, unfulfilled. 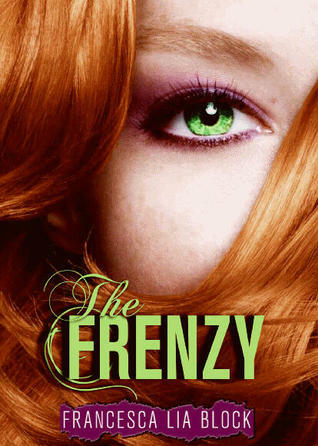 Liv is a teenage girl who sometimes feels a surge of rage. She has a strange affinity for wolves. She has reddish-brown hair covering a lot of her body. Her fellow townspeople keep dying whenever it’s the full moon. Seriously, is anyone reading this unable to determine what exactly is going on? I don’t even need to say it. Now, I think it’s fine for authors to write books about werewolves or rich snobby girls or whatever else is in vogue – if that’s your thing, or if you have a book in you that happens to be about something popular, that’s cool. Go ahead and write your book. But please don’t make the plot hinge upon the discovery of something that more than 90 percent of your readers will have figured out long, long before the main character. Please. Oh yeah, the young werewolf has a gay best friend. He is tormented & kills himself. It’s hard to care, what with his lack of character development and the rash of real-life gay teen suicides this year. This entry was posted in 2010, black, fantasy, Francesca Lia Block, gay male, secondary queer character, worst ever!. Bookmark the permalink.